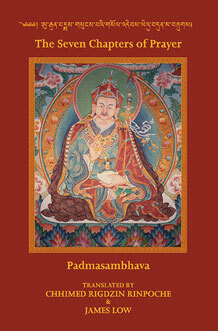 “The Seven Chapters of Prayer by Padmasambhava is a key text for all Buddhists at this time. It belongs to the treasure (terma tradition) of the Nyingmapa school and contains the authentic teachings of Padmasambhava concerning practice in difficult times. Prayer is a method of connecting oneself with the lineage, with Padmasambhava and with one’s own original nature. It is a profound and central practice used by all the great yogis of Tibet. As James Low describes in his preface, the idea to publish this book comes from a dream and is intended to help about the quick rebirth of Chhimed Rigdzin Rinpoche. The book contains besides the Seven Prayers of King Trisong Deutsen, Khandro Yeshe Tshogyal, Namkhai Nyingpo, Nanam Dorje Dudjom, Lhasae Mutri Tsanpo, Requesting Meditation Instructions and the well known Sampa Lhundrub Ma also preliminary prayers, some extensive lineage praxis of the Byangter (Byang-gTer) and Mindroling (sMin-Grol-Gling) system and several additional prayers such as the Barched Lamsel Prayer and the Prayer of the Stainless Biography. The book is well suited for praxis, pages are sewn and in hard cover. “I am happy to say that I and my colleagues have translated this practice, the gSol-’Debs Le’u-bDun-Ma, the ‘Seven-Chapter Prayer’. These prayers were discovered by sPhrul-sKu Zangs-Po Grags-Pa near Tsangs-sTod rGyang-Gi Yon-Po-Lung. On the tenth day of the rGyal (twelth) month in the Fire-Horse year, Padma Sambhava was sitting in the great temple of bSam-Yas. King Khri-Srong lDeu-bTsan, Nam-Kha’i sNying-Po, mKha’-’Gro Ye-Shes mTsho-rGyal, sNa-Nam rDo-rJe bDud-’Joms and lHa-Sras Mu-Khri bTsan-Po, the Las-Chan Dag-Pa’i ’Khor-lNga, or fortunate pure circle of the Ma- hacharya’s closest disciples, presented him with many rich offerings and requested a prayer. Firstly, Padma Sambhava taught them all the prayer to the dharmakaya, sambhogakaya and nirmanakaya gurus, and then the ﬁve disciples each requested a prayer to fulﬁl their need. To King Khri-Srong lDeu-bTsan he gave a prayer to the tantric lineage from Samantabhadra down to himself. To Ye-Shes mTsho-rGyal he taught the prayer about Zangs-mDog dPal-Ri and the verses for inviting blessing. To dGe-sLong Nam-mKha’i sNying-Po he taught the prayer to the various tantric lineages he had received and verses on how to purify visual perception, hearing and thoughts within natural understanding. To Na-Nam rDo-rJe bDud- ’Joms he gave the prayer telling of his deeds from the time when he was born in the Dhanakosa Lake until his departure to Zangs-mDog dPal-Ri. To lHa-Sras Mu-Khri Tsan-Po he taught the prayer describing the qualities of his body, speech and mind, qualities and activities. Also at Gung-Thang he later taught lHa-Sras Mu-Khri bTsan-Po thirteen prayers which are like wishfulﬁlling jewels for Mu-Khri bTsan-Po’s own royal descendants, and for all Tibetans. These prayers describe how he came to Tibet, saved king Khri-Srong lDeu-bTsan’s lineage and wished to go to Zangs-mDog dPal-Ri as an antidote to the cannibal rakshasas. Padma Sambhava promises to come every morning with the rising sun and to come every tenth day of the lunar month and make himself visible to the people. The prayers give protection from war, disease, famine, difﬁcult journeys, dangerous animals, earthquakes, troublesome yeti, robbers and authoritarian police, at the time of death, during the bardo, and from the other results of one’s karma. We have also translated the Bar-Chhad Lam-Sel prayer which saves all beings in the six realms from the difﬁculties that afﬂict them. And the volume concludes with the prayer listing all the important deeds of Padma Sambhava written by gTer-sTon Nyi-Ma ’Od-Zer. This entry was posted in Books, English Books, Praxis Books and tagged prayer. Bookmark the permalink.